Watts Bar Utility District (WBUD) is always striving to provide our customers with the most effective services possible. WBUD recognizes many of you have struggled with the high cost of water leaks and water line repairs. Many homeowners were surprised to find out they are responsible for both the extra water charges from water leaks and repair costs (which can exceed $2,000) or the extra water bill from the leak that can add hundreds of dollars more. As a result, Watts Bar Utility District is excited to provide a new service that protects our single unit residential customers from these very high and unexpected repair and water leak costs. The program WBUD has developed is called ServLine. 1. Water Loss Protection - The protection pays up to $2,500 for an increased water bill from a repaired plumbing leak and will allow one claim per calendar year. Since this is an enhancement and improvement of our current leak adjustment policy, you are automatically protected. 2. Water Line Protection - This protection pays up to $10,000 for repairs or replacement of your exterior water service lines. This protection requires each residential customer to sign up in order to be covered. You are automatically protected for Water Loss Protection, but need to sign up for Water Line Protection. For leaks that occur after January 1, 2016, ServLine will be the only way WBUD will adjust bills for water charges from water line leaks and breaks. You may cancel either Water Loss Protection or Water Line Protection (if you sign up and change your mind). However, if you cancel Water Loss Protection you are taking responsibility for all water charges from water line leaks and breaks. WBUD does not support or endorse any of the warranty products that are on the market. Our ServLine Program has more coverage with fewer restrictions than any warranty product WBUD has seen. Our team has worked hard putting together ServLine so that every residential customer who wants protection can choose to be covered for water line repairs and/or partial bill relief from water leaks. Please take advantage of our new ServLine Program. Please call 1-844-328-1041 to add Water Line Protection, cancel Water Loss Protection, or ask additional questions about our new ServLine Program. Water Loss Protection from excess water charges resulting from eligible plumbing leaks, up to $2,500. No Deductible. Please refer to our Billing/Leak Adjustment Policy for guidelines and qualifications for leak adjustments. As of January 1st, all residential leak adjustments will only be available through our ServLine Water Loss Protection Program. Covers repair or replacement of a water line up to $10,000. No deductible. No annual limit. 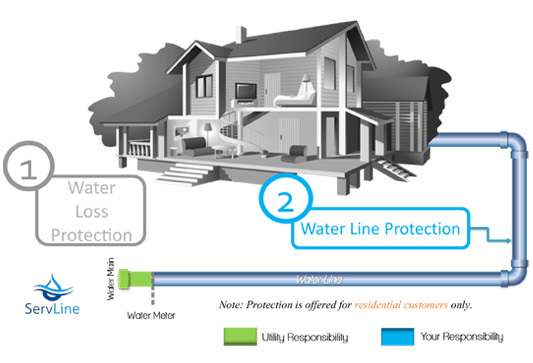 Provides Water Line Protection from your meter to the foundation of your home. Does Not Provide Protection For: Water Meter, Water Pit, Water Vault, Pumps, Valves, Or Backflow Meters. Be protected from these expensive repairs! Enrollment after January 1st requires a 30 day waiting period. Isn’t the exterior water service line the Utility Company’s responsibility until it connects to my house? No. The water service line is the homeowner’s responsibility starting at the Utility’s water meter. Can I decline participation in the ServLine Water Loss Protection Program and take my chances? * Yes. You do not have to take advantage of this program and can decline with just a quick phone call. * If you decline participation, you will now be responsible for all excess water charges from a line leak. ServLine is the new way WBUD adjusts water bills for qualifying leaks that result in excess water charges. * However, it would take over 65 years of monthly charges for Water Loss Protection to pay for only one excess water bill of $2,500. How many times per year can I make a request for bill relief from a water leak with Water Loss Protection? Water Loss Protection enhances our Billing/Leak Adjustment Policy for residential customers and follow the same guidelines allowing one claim per calendar year. Does Water Loss Protection pay for excess water bills from leaks that happen because of plumbing leaks that happen inside my house? What about leaks on irrigation systems or other connecting exterior water lines? * Water Loss Protection follows the same guidelines of the Billing/Leak Adjustment Policy it enhances. * Water Loss Protection does pay up to $2,500 for excess water bills resulting from leaks that occur in interior plumbing provided those leaks are quickly repaired. Water Loss Protection can also pay when there are leaks from the main water supply line from the meter to the foundation of your home. * Excess water charges from leaks on sprinkler water lines, irrigation system water lines, water lines to swimming pools, water lines to other structures, or similar water line connections to the main water line from the meter to the house are not covered in the Water Loss Protection.